Chocolate chip cookies are my favorite, and my kids’ favorite too. So, after seeing a few recipes for individual cakes and brownies made in the microwave, I was inspired to develop a recipe to make our favorite treat in just a few minutes. 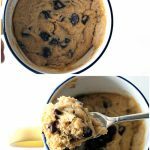 My kiddos are going crazy over this chocolate chip cookie in a cup, and the best part is how easy and quick it is to make. Edited to add: This is the original chocolate chip cookie in a cup recipe. Make sure you follow the steps and don’t substitute spreads for butter:0) For more fun ideas, follow me on Pinterest. Here is a quick video of my Chocolate Chip Cookie in a Cup recipe so you can see how easy it is to make! Add the chocolate chips, and give a final stir. 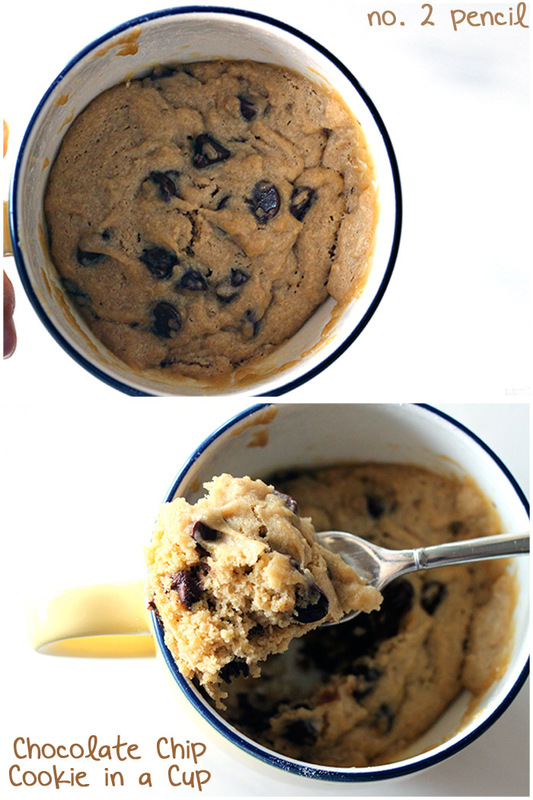 Now your mixture will look like cookie dough. Add a few chocolate chips to the top of the cookie dough. There you have it, a homemade chocolate chip cookie in just a few minutes…and no mess to clean up. Make this for your family, or yourself right now! It’s so easy! Let me know how you like it! If you like the Chocolate Chip Cookie in a Cup, try my Peanut Butter Cookie in a Cup, Sugar Cookie in a Cup, and Nutella Cookie in a Cup! 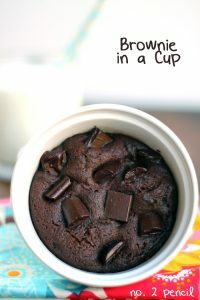 If you need a chocolate fix, try my microwave brownie in a mug. found this on pinterest….it looks fantastic…thanks for sharing!! It was soooo. Good. ! I made it with M&ms and omggg yummy it was like a cake and it stuck to the bottom of my cup but yea it was Fantastic !!!!!! Soooo yummy but I did it without chocolate chips and it only leaves you with thiiiiiiiiiisss much batter so if you’re not adding chocolate then make a little more of the cookie part. Amazing recipe though I loved it so much!! Thank you, Melissa!! I made this for my son and I last night. It was fabulous! He dunked chunks of it in his milk with a fork. I can’t wait to try this cookie recipe!! It feels like I’m eating something decadent and not healthy at all. Anyway I will have to try this recipe too, I am a sucker for things you can make in a mug. I found this site from pinterest as well btw. JUST what I want!!! Thank you!! I’m going to try it later this evening. i saw this on pintrest and literally grabbed my laptop and ran to the kitchen to try it. amazing!!!!!!! so easy, quick, and yummy!!! So I was craving a chocolate chip cookie and cursing my rural small town and my lack of energy to make some of my own when low and behold I find this little gem! You just made this expectant mom’s night! Thank you for sharing….It was delish! I’m an expectant mom as well and this hit the spot!!!! Not a small town girl here, but definitely not motivated to make a whole batch right now. LOVE THIS!!! Mine turned out a little “bready” maybe it was the flour… I’m willing to experiment because it was delish! oh my gosh this is sooooo amazing! made it for my daughter last night and she LOVED it! Just made this myself and it is sooo good! Oh my, oh my, oh my!!! These are even more delicious in person! Thank you! I found this on Pinterest this morning and just made me a “cup”. YUM! I LOVE it and thanks to you, I can fix my sweet tooth without making a whole batch of cookies. Like Amy, I found this on Pinterest this morning and just made me a “cup” that I share with my son…now we have to make another one for little brother and Daddy!! I love it. So easy, mess free, quick and delicious!! Thank you!!! Looks great! Gonna try it! Thanks for sharing!! My son and I made this after lunch today and loved it! Thank you so much for sharing! Wow, this is making me have the midnight munchies! Thank you for such cleverness :)! My girls and I just made this and it is AWESOME!! Yum! TFS! Love this!! my fav cookie in a cup…Only comment is save those egg whites for omelets in the AM. I hate throwing parts of eggs away. definitely going to try this!! thanks! I am your newest follower..pls follow back if you can. and what a fun after school snack! Found this on Pinterest. Just tried this with my boyz…pretty yummy! We topped it with ice cream! Thanks for the recipe! WOW! that looks so fun and yummy, can’t wait to try. found your blog today. New follower. LOVE this. I’m going to try this tomorrow night (tonight?) check my blog out if you get a chance. I found this on pinterest ~ wonderful treat for my kidlets! I hate having cookies around the house because I eat them!!! Thanks! You are going to get me into some serious trouble with this!! Lol! Warm chocolate chip cookies are my fave!! I would love for you to stop by and link to my Sew Crafty Saturday Party! Cruel person! This looks delicious, and compulsory eating. I agree with many of the previous posts, best version of cookie in the mug I’ve tried! Proportions are perfect, thanks! Hi! Visiting from tt&j. What the heck! I must live under a rock because I never knew about any cookie in a cup. Goodness. This looks so good.. and simple!! Im going to go try it now.. seriously! I just made this right now after finding it less than 5 minutes ago on Pinterest. I have to say it hits the spot if you love softer type cookies. I used margarine and whole wheat flour and I think it came out pretty darn good. Thanks for making my first anything in a cup adventure successful. Just made this Melissa, it was sooo yum!!! I did over cook it a little but only slightly…we could still eat it!! Thanks for this, will definitely make it again!! Just tried this and it was delicious! I substituted olive oil for butter and pasteurized egg whites for the egg yolk (in an effort to make it healthier). And because the eggs were pasteurized I could have just eaten the cookie dough raw, but I chose to just undercook it a tiny bit, so good! Oh my goodness! I just made the chocolate chip cookie and cannot wait to try the peanut butter! I only used 3 Tbsp of flour instead of trying to figure out scant 1/4 of a cup – I figure they are about the same amount 🙂 Thank you so much for posting this. Now that I can have cookies in under 5 minutes I will never be grumpy again. Just wanted to let you know I blogged about your cookie today if you want to have a peek. 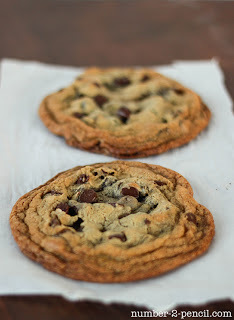 http://joandsue.blogspot.com/2012/03/5-minute-chocolate-chip-cookie.html Thanks again! I’m overwhelmed by the awesome response to my Chocolate Chip Cookie in a Cup! Thank you all so much, it has been very exciting!!! Love this! My blog partner and I both tried it (multiple times), and it’s such an awesome crave-satisfier! At 12am, and at dinner time haha. So yes, we also blogged about it 3 times. Haha thanks a bunch! I may or may not have doubled this 😉 Although I did share some, lol. It was fantastic!! I’ve been baking chocolate chip cookies since about 1969. I have made plenty of double-recipes, but I never thought of making a micro-recipe. Brilliant! OMG this is fabulous! Chocolate chip cookies are my weakness. Might be dangerous I found this. 😉 I just made it but used whole wheat flour instead of all purpose and it was amazing!!!! THAT LOOKS SO GOOD. how many calories is this? You don’t want to know. I just put it in a recipe builder. I was REALLY craving a chocolate chip cookie last night. And then I remembered I had recently pinned a cookie in a cup recipe. I’ll admit, I was a little skeptical since this was my first “in a cup” recipe. But oh. my. goodness. This was heavenly! Perfect! I took pictures as I made it and shared it on my blog, sending everyone here for the recipe! Thanks for sharing! can it be made in the oven? I like nuts in my cookies so I added 1 and 1/2 chopped walnuts to this recipe and I’m surprised how good it came out. I’ve never cooked anything in a cup before, well, except cup-o-noodles and this recipe was easy and quick. Kinda hard to wrap my head around the whole “cook a cookie in a cup in the microwave” idea but you’ve turned this skeptic into a believer! Mahalo! So easy! Beautiful pictures and easy to understand instructions. Just made a cup for my hubby and one for me. I added a dash of nutmeg to mine and it was delish! Thanks for sharing. This recipe is delicious. Definitely my favorite of all the “mug” recipes I have tried. Found it on Pinterest. Thanks.. I am making this.. now! Oh my! This looks heavenly! I’m going to have to try it, but I have to make mine gluten-free. I hope it turns out as yummy as yours looks! Thanks for linking up to our That’s the Ticket blog hop. I featured you on my post today! Anyone else end up with a yellow cookie? I’m assuming it’s from the egg yolk. delish! i forgot i ran out of vanilla the other day but decided to make it anyways and it is still so good! i am obsessed with cookies and this hits the spot if i’m too lazy to make an entire batch. thanks! I just made this last night, but mine came out like a cake and nothing like a cookie. I followed the recipe exactly so I am confused. What do you think I need to adjust to make it a “cookie”. thanks! Hello! I think I would make sure you aren’t using the egg white first, just the yolk and also make sure you are using enough flour. Compare your steps with the pictures in the post and make sure your dough is not too soupy before you microwave it. Hope that helps! Found this on Pinterest and just made it (okay, I made two of them!). Delish and so easy. And a lot better than making and eating a whole batch by myself. Thanks! I’m eating this NOW! Snap I burned my tongue. It’s good, my kids are going to love it. I’ll try the Peanut butter version next. LOL! I have burned my tongue too! What a crack up! Such anticipation for something nuked in a coffee cup. Crazy! Accidentally dropped some baking soda into the mix. Still turned out pretty damn good, just became more cake-like than cookie-like. Will definitely try again without the baking soda. Um.. I’m going to make this RIGHT. NOW. Just made this and it was great! I was out of chocolate chips so I drizzled some chocolate syrup on top…YUM! You are my hero. I have been trying to think of how to do this (I attempt many 1 minute muffins) and I didn’t want to fail so I didn’t try. Thanks for coming up with this, I am totally going to adapt ASAP! I’ll link it back to you! Great recipe!! I just made it. The only problem I had was the cook time. It took me about 1 minute 20 sec to 1 minute 40 sec in the microwave I used. But the cookie was delicious! does this turn out doughy? Thank you for sharing this yummy and original recipe on RecipeNewZ. Our viewers loved it and it was featured on our Facebook: http://www.facebook.com/RecipeNewZ. Congratulations and Happy Father’s Day! Hi there! This looks so darn delish…all of them do. Too bad I’m in diet mode right now, booooo! Give me a few weeks and I’ll be all over that though! 😉 Can you give me an estimate of how many ‘normal’ sized cookies this equals? It looks to be at least twice the size, but it’s hard to tell from the pix. I just don’t want to over do it once I can eat sweets again. Thanks! My daughter made this for me tonight. It was super good, but at 604 calories (yes, you read that right) per cup, it’s not for the everyday snack. I just looked up and added up all the calories for the ingredients (from actual sites, not discussion boards). The total calories per serving for this recipe looks to be 480. For my taste, I wouldn’t use as many chocolate chips, but it is still very heavy, very filling; a nice snack to fill an empty tummy! Mine turned out very cake like, i followed the recipe exactly. And it’s pretty yellow. Its okay but not what I was expecting. Just tried this 🙂 oh my gosh the last one “cake in a cup” recipe was god awful, but this is so amazing! i cant wait to tweak it! Eating this without the chocolate chips (didnt have any) and started cuping up a nectarine while it was in the micro, this stuff tastes great with a slice of cool fruit! i bet it’d taste cook with warm pineapple and cinnamon too! Not sure if you gave the site permission or not, but I found your recipe copied here: http://lacreativitedelafille.blogspot.com/2012/06/single-serving-deep-dish-chocolate-chip.html. As a blogger I would like to know if someone else uses my content without permission, which is why I am telling you. this is SO good…. I was really skeptical, as I’ve tried many microwave recipes for desserts and I have only liked one of them. However, this was delicious… I made one with crushed up oreo instead of chocolate chips & used quite a bit of vanilla. It was delicious.. Saw this recipe posted on Pinterest, and I made them for my kids tonight! They are amazing! Thanks for sharing. I posted the link on my blog to share with my friends. Your blog is great, keep up the good work! This recipe was just perfect! I was craving chocolate chip cookies but didn’t want to make a whole large batch – this totally satisfied my craving and was the perfect portion-controlled size! Thanks for sharing!!! Just stopping over tonight to pin this…….. and make it too! I’ve tried a few “in a mug” type desserts, but have become disenchanted because they’re all too spongey and eggy. It seems like by only using the egg yolk instead of the entire egg that it might not be a problem with this, but I just wanted to ask — is the texture (not flavor, but texture) comparable to a regular cookie, or is it more like a cookie cake? Made five of these little yummies tonight for the famdamily. Everyone loved them. Was just the right after dinner dessert with nuts and vanilla ice cream on it. Also posted it on my FB. You are a godsend to pregnant women! Baby and I thank you for sharing! ♥! My mother pinned this and having a sweet tooth in a diabetic house, we had all of the ingredients in the house. Thank you for sharing this! I halved this ( to make it a little more calorie friendly) and used vegetable oil instead of butter ( because I was out of butter) and it still turned out great! Om nom nom nom. I did it in a little mug to make sure it wouldn’t be flat! I don’t think i did it right. It came out as this big blob of grossness… Help? I am so excited to make this. 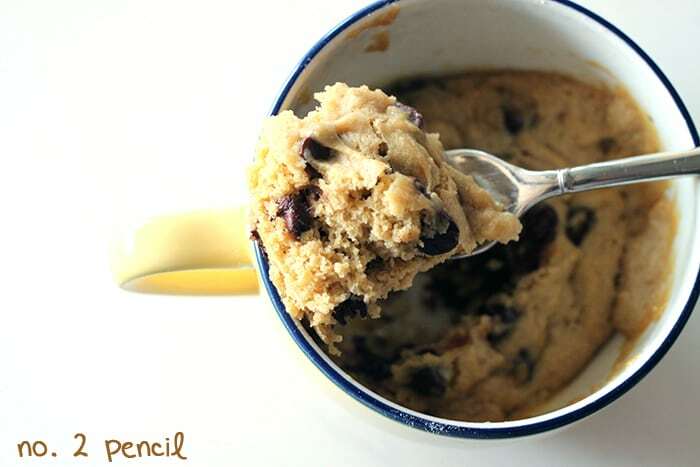 This is like the only recipe of cookie in a cup that everyone claims work, even for amateur bakers like me. 😀 But I was wondering, will it be affected if I put it in a paper cup and not a ceramic mug or something? Holy crap. I pinned this several months ago, but just made it tonight for my chocolate-chip-cookie-loving husband. This is amazing!! Little to no clean up, took all of 2 minutes to make, and is DELICIOUS! You are my HERO!! My kids are 4 and 2 years old and loved helping me make it and of course they loved them! Thank you! I made this today and followed each step exactly. However, when I popped it into the microwave for 40-60 sec., it turned out sponge like. Did this happen to anyone else? What am I doing wrong? I tried the chocolate chip cookie in a mug recipe today but my cookie ended up looking muffin-like…can’t wait to try your version this weekend! This was decent. I think I could’ve used less flour and ate it with a spoon instead of a fork. Definitely a full min in my microwave! Thanks for keeping me from eating a batch of cookies! I made this tonight. After a few trial-and-errors, I have to admit; it’s delicious when it’s made right. I posted my version of your tutorial on my blog today, I gave you credit and linked back here. Awesome recipe. I just made it myself and plan to post about it and give you the credit. Thanks for sharing. Love the quick and easy things. THANK YOU FOR A GREAT RECIPE! Who knew it could be so simple and easy! It sure beats making the whole batch of cookies and then having so many left over! This is GREAT! and the PERFECT amount! can’t wait to make this but throwing out an egg white? no! pop it in the freezer until you get a bunch and then, make something special with those. Like pavlova or macarons! Just found (and liked) your blog. Can’t wait to scroll through and try new things! So eager to make this. But i dont want to use egg. any alternative to using the egg yolk? I’m not sure! Let us know if you find something that works for you, some have suggested banana or applesauce. I don’t think those will create the right balance though. Yums. I used real brown sugar, but I used Splenda due to some sugar issues for the white sugar. For those asking the egg question, I used half an egg’s worth of an egg substitute and it came out great. So if you don’t want to separate an egg and have Eggbeaters or whatever, just use half an egg’s worth of that. It is more like a dense cake or cakey cookie texture, but super yummy all the same. I’ve done this on a plate for a couple of years in middle of the night, for a midnight snack with premade cookie dough. It makes a wonderful ooey gooey yummy snack, so I’m definitely going to try this. My DW started making mug cakes and we love them. So I started looking for mug cookies hoping they’d be a little firmer. Thank you for the excellent ideas to further my quest for a micro mug cookie!!!! Does 2 tablespoons of sugar produce a rather sweet cookie, should I use 2 teaspoons instead to avoid that or does the amount of sugar used make a regular not too sweet cookie? Question: I can’t have eggs, so I use Ener-G egg replacer (I don’t love it.). Would that be ok tousle, even though you only use the yolk, and the replacer is for a whole egg? the dough looked so good i ate half of it before i could even put it in the microwave =) the end result was delicious too!!! thanks! My hubby loved this ~ the perfect ending to the perfect day used mint choc chips ~ absolutely yummy!! Mine came out just like TamTam but I see what I did wrong now. Used the whole egg. This looks so good. My stomach is growling! I love this recipe and posted it with my own photos on my lifestyle blog Bmore Energy, http://bmoreenergy.wordpress.com. I linked it to you and will be back to try other recipes. Thanks! This was fantastic. I often get cookie cravings and instead of making a huge mess in the kitchen to bake a dozen cookies I will end up eating myself, I can have a smaller portion that hits the spot 🙂 I will experiment with some healthier alternatives to the ingredients, but as written its delicious. I replaced the egg yolk with a tablespoon of peanut butter and it was perfect. Just finished making a couple of these for the hubs and myself, pretty darn good! It came out a bit cakey, but I think I put too much flour- I was going to make my usual brownie in a mug, but we are house sitting and there was no cocoa to be found! Thanks for helping our sweet tooths! I really really want to know that how many days can i keep this mug choc chip cookie? Or how many hours ? I wan to do this for my bf , but he live in another province 3 hours away from me . Please answer me. Thank you. Ok 🙂 Thank you so much . I think i’ll make it there instead . I made this at work last night! I had a horrible craving for something sweet… Also didnt have an egg with, so I substituted it with applesauce! It was so moist and amazing! Thanks so much for this recipe! I’m trying to get back into the groove of making home made cookies my family will love. This is so fun! Love it! Just pinned! Do I need to say anything more than YUM! I will go to bed dreaming of warm cookies! Oh my goodness!!! I just came over here from craftedniche.com for this recipe and am now beyond excited to see all your other variations. Must get to my microwave right away. HI! I just came over from Crafted Niche, also and I’m here to stay! Can’t wait to try this!!! I some how stumbled onto your website one day and found the cookie idea, so i thought i would try it. At the time i had no brown sugar, but then today i decided to make it. It was amazing. I made it for my sister and I. TO DIE FOR! I even made it without the chips and it makes a pretty legit sugar cookie as well 🙂 Thanks for sharing! I convinced my momma to buy me some chocolate chips so I could try this. All I can say is they are absolutely amazing, so glad I found this recipe! Hey. I’ve made this several times before. AMAZING! Anyway I extremely dislike that I have to throw away the egg whites. Keeping them isn’t worth it because I hardly ever use egg whites by themselves. Any suggestions for a substitute? Can I just use the entire egg? This was AWESOME! Me and a 6 year old I babysit each ate one and they are AMAZING great for when u don’t want to make a whole batch of cookies! Hi ! A French website shared a link towards your page and I’ve just tried the recipe ! This is amazing, it’s really faster than traditional cookies ! I think there is a little bit too much sugar though (but a friend told me that in France we tend to put very little sugar in things we eat ^^) 🙂 I ate it with vanilla ice cream while it was still tepid and it was delicious *. * Thank you soooo much, this is going to change my life ! You are a genius and my new hero. This is so awesome! Thanks!!! i love this recipe..but due to its many carbs and cals i tried to substitute sugar with Erythritol (1 big TB & fluid stevia) and coconut flour (a bit less than a TB). it turned out GREAT too!!! SO easy, SO tasty! Not quite as good as one of my famous chocolate chip cookies fresh from the oven–but definitely the next best thing!!!! What if I don’t have brown sugar? Will there be dramatic change if I don’t add it? It will definitely change the texture. Brown sugar is an important part of the recipe:0) Let us know if you try it! I was laying on the couch, thinking to myself… man, I could really go for a cookie right now. Found this gem on Pinterest and actually made it (I have a habit of pinning things and never making them)! It was wonderful! I didn’t have any chocolate chips on hand, so I threw in about 15 M&M’s, thank you Easter bunny,..tasted fantastic. I used a black mug and set the microwave for 40 seconds. It definitely came out more like cake, next time I’ll try 30 seconds. I WILL be trying more of your mug recipes! Thanks! Decided to try my first “in a mug” recipe and this was it. Wanted super easy so decided to swap out the egg for applesauce. Cooked it for 50 seconds & it was “bready” as some have said. Didn’t want to give up, so I nuked it 20 more seconds and voila! I just dumped my chocolate chips in so it was a tad too chocolately for me, but definitely a keeper recipe. Thank you! This was delicious, but if you’re watching your calories and fat, be careful! One mug cookie has 420 calories and 16 grams of fat. Make sure you are using butter, not a spread or butter substitute:0) That is the most common problem people have. Just tried this now for my granddaughter, wow it was yummy!!! Thanks for sharing! Yummy! So… I have barely tasted it, however from what I tasted it’s excellent. It’s very barely-baked cookieish which I LOVE. Mushy with a little crisp. I doubled the recipe (to share) and added ~3 1/2 tsp unsweetened cocoa powder. It is not as sweet as a regular chocolate chip cookie, but I feel like that has to do with the cocoa powder and my use of semi-sweet morsels instead of milk chocolate. I just tried this. It was great. I put some chocolate ice cream on top. The ice cream melted perfectly! Hi ! Just tried your amazing recipe. Being the dreadful cook that I am, I was more than glad to find it. So I judt tried it twice. first time, too much flour, the cookie was awfully dry. the second time I was more lucky but still a bit too floury even though I added melted butter before cooking the whole. it turned out both too floury and too “buttery”… but it’s not as terrible as the first one about the taste. next time maybe ! Anyways thanks a lot, I’m gonna check the rest of your website and probably try another recipe by tonight. I’m done with cookies for today ! Thank you thank you thank you!! I have been craving a cookie so badly but in the midst of a kitchen demo and remodel and the 90+ degree Arizona weather I have been putting them off. Just had one of these delicious babies on my lunch break. You have completely made my Friday! Thanks again!! Can’t wait to try your other recipes! I loved this recipe so much I want to make another one. Only problem is I do not have butter so can you use oil instead? Just made this for a late night snack YUM! I made mine gluten free, using rice flour in place of regular flour. FINALLY! A “dessert in a cup” that isn’t undercooked on the bottom! I love it! I tried this, but didn’t have DARK brown sugar so substituted it with light brown. Plus, I didn’t add chocolate chips because I’m alergic to them, but… It’s actually perfect for a quick morning breakfast in a cup. IT TASTED JUST LIKE A PANCAKE!!!!!!! So yeah……. This is the second recipe I tried for cookie mug recipe. It’s perfection in a cup! Best recipe I’ve tried! Only suggestion is just use room temparature butter. It doesn’t take long for a tablespoon to hit room temperature and become soft! This is definitely a keeper recipe! Just made this on a whim… amazing! Gonna make it for my mother’s pudding tonight me thinks. Mine turned out a little undercooked at the bottom, but it wasn’t a major issue once mixed with a little cream. Delicious and the perfect serving size! So we split the egg in half and ended up with super moist cake (sort of like a steam cake) and we poured milk inside. It turned into a delicious cookie cake bread pudding!! i just made it and although it didn’t come out perfect, it’s pretty darn good! I used coconut oil instead of butter cuz I love the flavor. I think i baked it a little too much because it’s a bit dry and grainy but it’s divine with a scoop of ice cream on top. this definitely fixes the 3am warm and gooey chocolatey craving! There are a lot of variables that can change the texture of baked goods, which is what this recipe is. How long you mix it, the kind of cup you use, the strength of your microwave, the fat content in your butter and egg yolk, the altitude you are cooking at. I would play around with the ingredients a little bit and see what works for you. Do you want more chewiness? I would try a little more brown sugar. Also don’t over cook. Great, thanks a lot. Now I’m hungry! Where’s my brother with the butter?!?! its the same to use kosher salt than normal salt? Table salt will work as well. Wheat flour would definitely change the texture and consistency. Let us know if you try it! Hi, is it possible to use a box of cookie ready mix for this recipe? I haven’t tried, but please let me know if you do. I would love to hear how it turns out! I just made this and IT WAS SOOOOOOOOOOOOOOOOOOO GOOOOOOOD. THANK YOU THANK YOU THANK YOU!!!! I’ve tried this about five times, and every time, it turns out more like cake than a cookie and all the chocolate sinks to the bottom. I’ve tried changing the time it cooks, but it still turns out cake- y. Any tips? I have a few suggestions you might try. First, make sure you are using real butter (spreads won’t work) and not substituting any of the other ingredients. Don’t over heat the butter when melting. The butter should be just melted, not boiling. Make sure you are following the steps in order when mixing the ingredients. The chocolate chips are mixed in last, so unless the dough is very runny, they should not sink. Try using a different cup to cook the cookie in. I like a wide round cup best, like in the picture. Finally, don’t over cook. SOOOO yummy!! THANK YOU for sharing this easy, yummy recipe! I put a little vanilla icecream on mine and devoured it right up! Perfect “mommy wants a treat, but doesn’t want to make a big mess after the kids are in bed” treat! Me and my sister had both been seeing mug cakes everywhere. We decide both to make one of your microwave recipes and compare. I made the chocolate chip cookie and she made the brownie. I really liked the cookie after it took a couple second to cool. My sister burned the first brownie. She remade it and I tasted it again. The brownie was good, but I preferred the cookie. This was quite good! I add a sprinkle of cinnamon and it came out great. Just tried these out with my little girl- fabulous & so easy for a little project with a toddler who doesn’t have the attention span to wait for a full batch of cookies to bake! I tried this because I don’t have access to an oven in my dorm and was craving chocolate chip cookies. This is perfect! I’ll be making these again for sure! Thank you! omg! Thank you so much I LOVE this! Just made this. So easy and so yummy! The clean-up was minimal too. Perfect snack when you have a craving but don’t want to have cookies around all week. WOW! I truthfully thought this was going to be gross, but I tried it anyways and boy was I wrong! This is SO GOOD. I’m stuffed and I still have half left. Thank you so much for the recipe. The kids love it. I used half M&M’s and Chocolate Chips. Yum! I make this recipe a lot… probably a little too often. So when I ran out of eggs one night I decided to improvise! I used coconut sugar as a brown sugar substitute, applesauce instead of egg yolks (1 tbsp) and whole wheat flour instead of all purpose – it turned out great! Obviously not as sinful as the original but it definitely was satisfying! Thanks for the great recipe! Egg people…just use a flax egg (2 1/2 tbs flax meal to 1 tbs water). That way you can safely eat it as dough if you can’t wait to cook it! Plus flax is full of healthy omega 3s. I have tried 2 different recipes that failed terribly. This was so tasty and delicious. It really tastes so good 🙂 thank you!!!!!!!! I love this recipe! I’ve altered it a little to make it into my favorite oatmeal scotchies, but it’s always so tasty and fool-proof! For the scotchies, I sub out half the flour for plain oatmeal, and then in place of the chocolate chips, I use butterscotch chips. Once you throw in a little bit of cinnamon, it’s exactly like the cookies my mom made for my school lunches. i LOVE this recipe! I make it every time we have chocolate chips in the house! Fantastic. I’ve made this several times now, and it’s great for a easy little treat without much work. The first time I considered doubling it because I wasn’t sure how much there’d be, but was pleasantly surprised with the amount. More like a 2-3 cookies than only 1, which is perfect. No, no, no, no, NO! I am trying to get out of my fat pants!!! 😀 Sooooooo good. Lemme just say this. Store-bought cookie, our relationship is OVER! Um, well, as soon as I find some more dark brown sugar. But THEN our relationship over! We tried this tonight and it was delicious! It was the perfect night to try it because we are in the middle of a big snowstorm, so it just sounded yummy and warm for dessert. We topped ours with ice cream and hot fudge. Everyone LOVED them! I have about a million different kind of leftover baking bits & chips from Christmas, now I have a new recipe to use some of them in! All the possibilities… white chocolate chips, macadamia nuts, dark chocolate chunks, mint chips, m&m’s… ohhh, peanut m&m’s sound amaaazinngg!! Sweet warm rich and delicous. I swapped out choclate chips for a spoonful of unsweetened cocoa . Like a brownie and a cookie in one warm gooey and yummy. I made the orignal at the same time and the cocoa version was even yummier although both were amazing. I tired this yesterday and it was absolutely amazing!! This just changed my life! Seriously, I have tried dessert in a cup recipes before but they never tasted like the real thing. This does, it is fantastic! It’s just like a real, home made, hot gooey chocolate chip cookie. Thank you, thank you, thank you! I made some changes to this otherwise perfect receipe. I don’t eat egg yolks so I used 1 egg white. I used a dash of cinnamon. I used less than 1 tbsp of raw sugar instead of refined white. I used a heaping and packed tbsp of brown. For the flour I used less than 1 tbsp of whole wheat flour. I used a tsp of walnuts and almonds chopped and a tsp of some coconut in addition to the choc chips. I microwaved on high 50 seconds and additional 10 seconds. Came out perfect. Thanks. Why doesn’t someone make a recipe of the dry ingredients and figure out how much you need like say 3/4 cup and then add the wet ingredients to it. I would be a lot easier than trying to make 4 of these for your family. Just a thought! I have made this many times. So delicious!! I absolutely LOOVVEEED this!!! Its so awesome I keep craving it half the time! Why not use the whole egg? When I double the recipe can I just add one whole egg or two yolks? This was amazing. The sun came out from behind a cloud and lit up the kitchen just as I took it out of the microwave 🙂 I also burned myself trying to eat it before it had cooled. Sooooo yummy! I don’t usually like dessert in a mug recipes, but this is definitely an exception! It tastes great, and has a very unique texture. Almost like a mixture of cookie dough and cake, I don’t know how to describe it but it was AMAZING. I wholeheartedly recommend this cookie in a mug! This cured my chocolate cravings 10/10! So yummy, especially with a big glass of milk. I doubled the recipe to share with my hubby, and I’m pretty sure this is going to become a weekly thing! Delicious! I LOVE sweets, but I thought this was too sweet. When I make it again (and I will because I do think this is a great starter recipe), I will cut the brown sugar, white sugar, and chocolate chips in 1/2. I also added a pinch of baking powder and baking soda since they are in full batch recipes for chocolate chip cookies. Great recipe, a little too sweet for my taste. I left out the choc chips but mm yummy mine went in the microwave too long though but it was still a cup of yummy goodness! I’ve done this a few times and once I had to bastardize it beyond all measure XD. Amazingly my family didn’t have plain flour, butter or even margarine in the fridge, much less chocolate chips or chocolate. So I subbed in one tablespoon of vegetable oil in place of butter, self-raising flour in place of plain flour, and a combination of walnuts and Milo powder mixed with some water instead of chocolate. Amazingly, it turned out pretty good. Just letting everyone know that in a pinch, vegetable oil can be used in place of butter and self-raising flour might work if need be. I found this tonight by Googling “microwave cookie for one”. My husband was poking around looking for a treat and was disappointed he couldn’t find anything. I didn’t have chocolate chips but made the recipe otherwise as instructed and threw some pecans in. He loved it. I earned some big points tonight! Thanks for the awesome recipe. I was looking through pinterest…after the reviews being from so long ago..I decided to add mine… this was exactly what I needed to get my craving under control. Lol it was soooo delicious! Thanks for the post. I’m so late to find you! Thank you so much for sharing this recipe! I was thinking back to my college dorm days, wishing I’d had some decent recipes to use when I was hungry. Well, 22 years ago there was no Pinterest or public internet, so I was out of luck. Thanks! I’m really enjoying the chocolate chip cookie! It’s delicious! Wow, this is really amazing. Thank you so much for sharing this recipe! My hubby was craving something sweet so I Googled mug cookies and this recipe was listed. I made this for him and he was extremely happy with this. He ate the entire mug cookie in one sitting so I know he loved it. will it work if i use golden brown sugar? I just tried this.. delish!!! and so easy. Thank you, thank you! for this recipe. I love me some chocolate-chip cookies, but can’t handle the temptation of having a whole batch in the house. This is the perfect portion size to satisfy my craving without the time and mess of making dozens of cookies. My sweet tooth and waistline thank you again! I found this on pinterest, and after a whole slew of pinterest recipe failures I was so happy to find a successful one! I have tried this recipe many times and it never seems to turn out how the pictures look. Overall this was an awesome idea and maybe next time I’ll get it. If you you give me some tips that would be great. Thx for a great after school snack! Mine wouldn’t cook, even after twice the recommended time. I added some milk to make it seem like the cookie was soggy with milk instead of raw. The flavor was good, but I think I’ll stick to the single serve baked cookies instead, which are totally amazing! 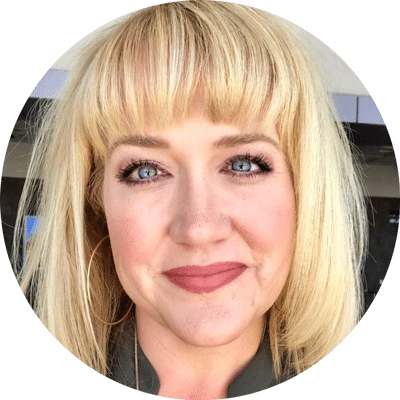 Wow – amazing recipe – THANK YOU! I served this warm with vanilla bean icecream and substituted the flour with gluten free flour (Pamela’s GF Artisan Mix). It was amazing!!!! I, like many others, found this recipe on Pinterest and I love it! I made this recipe this morning! I added some pumpkin pie spice creamer and a dash of cinnamon! It gave it a nice fall taste! Definitely something to try! Hey this is a very strange question, but if I have a block of butter, am I pressing the hard butter into the tablespoon measurement , or melt it first then measure a tablespoon of melted butter? For something cooked in the microwave this was amazing. I’ll be adding this to my saved recipes when I’m looking to cure that sweet tooth craving! In case anyone was wondering, I just tried this with Pamela’s Gluten Free Flour and Earth Balance to fit my allergy needs and it was divine! I used to eat this all the time before I gave up dairy permanently, and a year later I found out that I was gluten intolerant. I assumed that quick desserts like cookies in cups couldn’t work with gluten and dairy free ingredients, but it worked perfectly. This is amazing when you want something sweet. It’s quick, easy and taste great. You can make it, eat it and not feel guilty that you just ate a half a dozen cookies. I use this receipe all the time as a quick go to. Thank you so very much. OMG this was absolutely flipping fantastic! Fresh chocolate chip cookie goodness in mere minutes with no mess! Thank you for posting the recipe!!!! A ittle too many chocolate chips but overall a satisfying recipe! Omg! This is the best mug cake I have ever tried! I’ve tried a lot of different recipes and I was never completely satisifed. Finally, I just found yours, the perfect one! I just made it and the texture is amazing and it tastes soo good, I can’t believe how good it was! Thank you so much! I just made this because I was craving a chocolate chip cookie! It was delicious! I put my batter in a ramekin though and microwaved it for 45 seconds and it came out perfect! It reminded me of a fresh chocolate chip cookie out of the oven ( I love my cookies chewy). Thanks for the recipe! Thanks for sharing this recipe! I’m on the hunt for a chocolate chip cookie mug recipe that isn’t overly sweet or overly cakey. I’ve yet to find THE recipe, but I’m hopeful this one — which I’ll be trying tonight — is it. 🙂 In any case, I’m pinning it! This is a great recipe and comes out perfectly as written. Delicious!! 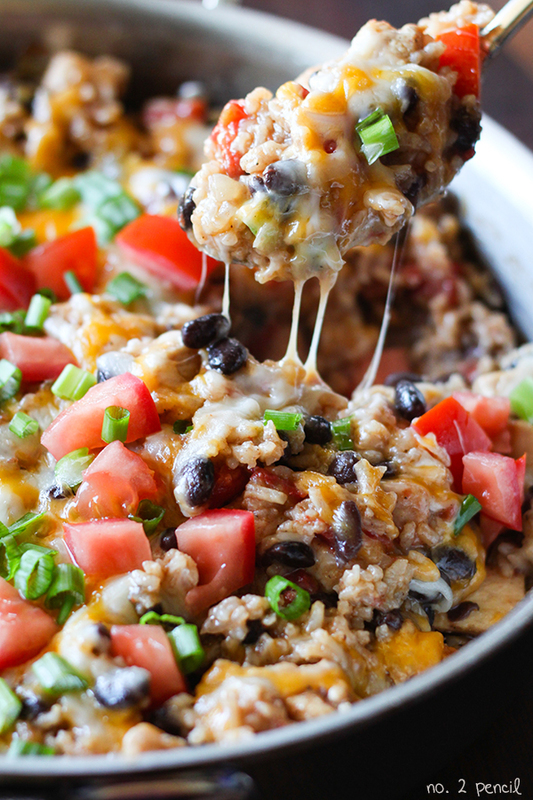 Quick, easy, and really yummy! This seems delicious. I just loved it and cant wait to make a bite on it. And I am also amazed by its nutritious values. Best mug dessert recipe I’ve ever had. 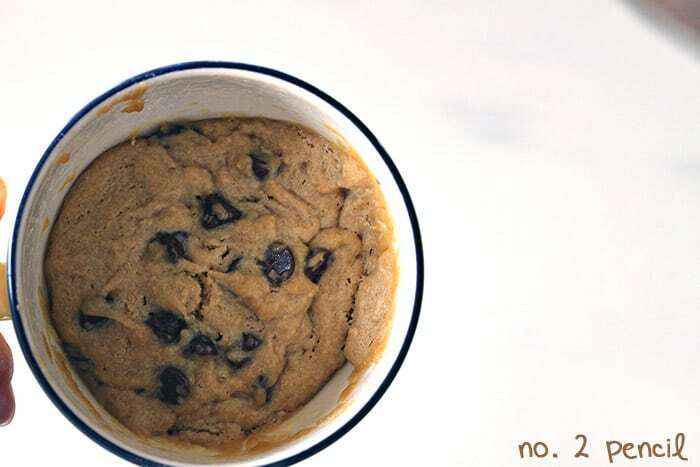 I keep trying new mug recipes and they never impress me as much as this cookie in a cup. HOLY CRAP, THESE ARE AMAZING!!! !